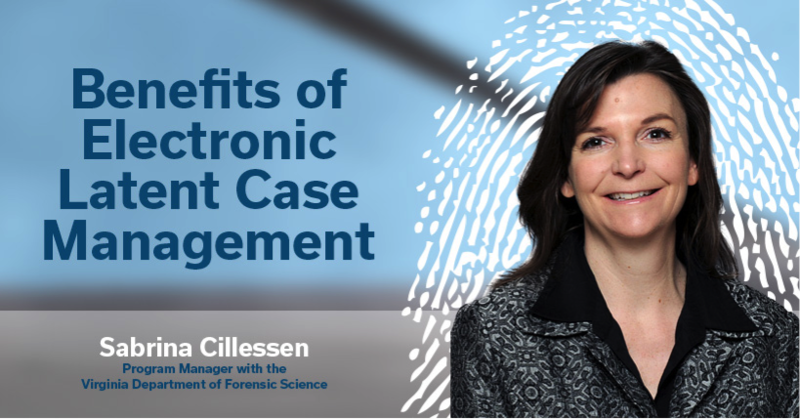 We recently talked with Sabrina Cillessen, a Program Manager with the Virginia Department of Forensic Science, about her thoughts on how the implementation of an electronic latent case management system (e-LCMS) improved efficiency and consistency. Sabrina has worked with the Department since 2011 as Program Manager for technical and quality aspects of latent prints, firearms, and computer forensics. She was previously at the Arizona Department of Public Safety as a criminalist in the latent print department and is a latent print expert. What was your documentation process before you implemented an electronic latent case management system (e-LCMS)? Case notes were hand written and digital images were printed for analysis and comparison. Were there problems with doing things that way? In switching to e-LCMS, we were looking for improved efficiency and consistency while increasing the amount of documentation related to the basis for the conclusion in the case notes. What were the main factors in choosing to implement an e-LCMS? The Department chose to implement electronic note taking to create more consistent case file documentation and provide more robust documentation of comparison conclusions. How did your process change, and what are the benefits of the new process? Were there any unanticipated benefits? Our workflow changed drastically because we went from performing comparisons using printed photographs to viewing the images on screen and marking characteristics used to reach a conclusion for every print. The benefit of this approach is that it enables someone reviewing the case file to clearly see the basis for the examiner’s conclusion. Implementing e-LCMS with the Star Network allows examiners in different locations to view images simultaneously and more readily consult on conclusions. Verifications can also be done in different locations without having to transport paperwork across the state. Which factors are the most critical to the needs of your agency? Quality and timely result reporting. Does having an e-LCMS like Mideo LatentWorks save time? The time savings is associated with the level of documentation we are able to create using Mideo Latent Works. The level of detail associated with the conclusions would take significantly more time if it were completed using traditional means. How have evolving documentation requirements of latent print evidence affected your approach? How did an e-LCMS help? The ability to efficiently create documentation demonstrating the basis for the conclusion is essential for the latent print community. The workflow possible with e-LCMS makes the demand for increased documentation easier. We require a side-by-side comparison for every identification. The tools available in Mideo make this easier than traditional charting methods. We would not be able to create the same level of documentation in the same amount of time without Mideo. How do you see documentation evolving within the next few years? The field is moving towards the marking of characteristics used to determine the value of the latent and the weight an examiner puts on the specific characteristics during the comparison step. At some point, it will no longer be acceptable to render an opinion without documentation visually demonstrating the basis for the conclusions. The use of statistics in the latent print community is also underway, and the e-LCMS workflow will enable a streamlined implementation of the data into the case file. How does an e-LCMS benefit your latent print department from an accreditation/re-accreditation stand point? We are able to more efficiently meet our accreditation criteria utilizing the e-LCMS. We were meeting the criteria prior to the implementation of the electronic workflow, but with the e-LCMS, we are able to increase the documentation without sacrificing time and resources. Are there other advantages to a software-based system like Mideo LatentWorks? It is much easier to do verifications and consultations with examiners in multiple locations. The examiners in all four of our labs have access to the information, which allows them to remotely verify images and consult with their colleagues. LatentWorks also has a created workflow, but you can modify it to suit your needs. My analogy is that, previously, you had to build your house; now the house is built, and you just have to move a few walls. How is customer service from Mideo? They are always very responsive and do what they can to help. To learn more about how an e-LCMS can benefit your organization, read about LatentWorks here.